One year ago at the Grand Prix Series Awards Party, Steve Husko was awarded the title of “Mr. Grand Prix” – the male runner with the most races. Steve ran 19 out of 27 GP races. His wife, Patty, also ran 19 races but was denied the women’s title by Edythe Hulet who ran 22 races. As they left the premises, I suggested to Patty that she and Steve should go for the title of “Mr. and Ms. Grand Prix” in the upcoming 2016-2017 Grand Prix Series. Patty seemed reluctant but a spark of interest shown in her eyes. Little did I know how determined this couple would be to take on this challenge and pursue their quest to become the first couple to earn this prestigious title. They began their quest with the Series kickoff – back to back races just 2 weeks later. The Viking Fest 5 mile run on Saturday was followed by the Rhody Run 12k on Sunday. Both races were held on challenging courses with many tough hills to conquer. To do these races, the Huskos drove all the way from their home in Elma to Poulsbo and Port Townsend. Clearly they had made a commitment to go for it. The Series had 27 races throughout the year which began in May 2016 and finished in April 2017. To make things a little more difficult, the Lunar Run was added to the schedule bringing the total races in the Series to 28. At each Series race, no matter what the distance or the destination, the Huskos were there. The competition for most races among the male runners was initially close with Jerry Bronson and Dave Sherman challenging Steve for the title. When it became apparent that Steve was going to every race, no one could keep up with him and the total number of races he ran kept growing. Patty faced another challenge. Judy Fisher missed the first race in the Series but she too began to do each race in the Series. If Patty missed even one race, Judy could catch up or take the lead. If Patty wanted to claim the title of Ms. Grand Prix, she would have to do EVERY race throughout the year in the Series. The excitement between these two determined competitors mounted as the Series drew to a close. Patty had successfully completed every race in each distance from the 5k to the half marathon. But the final event in the Series was the Tacoma City Marathon, a distance Patty had never attempted. Judy, a veteran marathoner, was assured of adding this race to her total barring injury or illness. If Judy did the marathon and Patty didn’t, they would tie in total number of races. The tie-breaker and the title would go to Judy as the older runner. With unequaled determination, Patty rose to the challenge and became a first time marathoner and winner of the title Ms. Grand Prix. Both she and Steve ran 28 out of 28 races in the 2016-2017 Grand Prix Series! Mr. and Ms. Grand Prix. Steve (center) and Patty (right) finish their first marathon with good friend, Charlea Sherman (left). Steve and Patty also became the first recipients of the prestigious Sandra Madden Award for Exceptional Performance. This award was named after Sandra who ran every race in the Grand Prix Series in 2015 – an amazing achievement, duplicated in 2017 by Steve and Patty. It was an exciting day for the Huskos who inspired all of us with their determined pursuit of their dream. Congratulations, Steve and Patty! We can’t wait to see what you will do next! The 7th Annual Silver Strider Awards Party was held at the Old Spaghetti Factory in Tacoma. The awards were to take place in two parts. Part one was the TOP IO Super Athlete awards. Part two was the Grand Prix Series awards. The banquet room was packed. Betty Dietrich was introduced as the Silver Strider online magazine Editor. 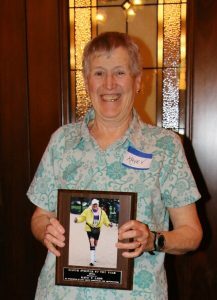 Betty was also credited with being the catalyst for the Silver Striders by setting in motion events that would culminate in this awards party. 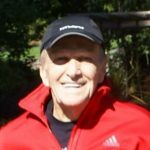 Bruce Fisher was introduced as Silver Strider photographer, Rewarding Runners Financial Officer, and creator of the Silver Strider Calendar. Next the TOP IO contributors were introduced. These are the volunteers who compile the rankings. They are: Ed Heckard 5k, David Longmuir 10k, Jerry Dietrich Half, and Judy Fisher Marathon. To gain Super Athlete status the athlete must be ranked in the TOP IO at all four distances on December 1, 2016. Only 9 athletes in the state of Washington achieved this remarkable feat. Each of these runners was presented with a personalized Super Athlete Ring and a gift certificate from South Sound Running. The Super Athletes were recognized for possessing both speed and endurance. Below are the Super Athletes in order of presentation with rankings shown in parenthesis for 5k, 10k, Half, and Marathon. Super Athletes (l to r) – Mick Allen,Ed Heckard, Judy Fisher, Carol Sexton, Kristen Mossman, Ed Hoekman, Sandra Madden, Dave Sherman, Arne Hales. Jerry Dietrich opened the Grand Prix Awards ceremony with a request for a moment of silence for our departed 2016 Silver Strider of the Year, Kaye V Ladd. Acknowledgement of the contributions by the party committee, Molly Childs, Nanci Larsen, and Tiare Bailey were made. Thanks were given to our sponsors: The Tab Wizard, South Sound Running, Super Jock n Jill, TCMA, Fleet Feet of Tacoma, West Seattle Runner, Rt. 16 Running, Shoes n Feet and The Balanced Athlete. Each finisher in the Grand Prix Series received a personalized trophy and a free entry to an upcoming Series race. First place finishers also received a gift certificate for a pair of shoes from South Sound Running, 2nd through 4th place finishers received a $50 gift certificate, and 5th and higher received a $40 gift certificate. The awards were given in 5 year age groups starting with Men 50-54 and ending with Women 85-89. Table centerpieces designed by Nanci Larsen. Each was filled with 5k, 10k, and Silver Strider M and M’s. Prize drawings, donated by merchants and Silver Striders, were held throughout the program. They included an Emerald Downs Day At The Races, (2) 1 hour massage therapy gift certificates from BeHive massage, gift cards to many outstanding restaurants, and $50 bowling gift cards from Kent Bowl. The final drawing of the afternoon gave away two major prizes. First was the grand prize, an overnight stay for two in a luxurious fireplace, jacuzzi suite at the Wesley Inn of Gig Harbor. The winners of this coveted prize were Steve and Patty Husko. The second main prize was a deluxe Fitbit Heart Monitor watch, donated by Molly Childs in appreciation to all of the Silver Striders who generously contributed to the BTA 5k on her daughter’s behalf. Nick Bailey was the winner of the drawing. A special achievement award was given to Judy Fisher as the “Perfect Score Champion.” Judy set a record with 27 consecutive first place finishes in the 2016-2017 Grand Prix Series. Judy was presented with a bottle of champagne with her name and achievement customized on the label. The next award was a closely guarded secret. Everyone eagerly awaited the announcement of who would be recognized as the “Silver Strider of the Year”. In appreciation for his dedication, participation and enthusiasm, this year’s recipient was Bruce Fisher. Bruce received a standing ovation accepting his plaque and $50 gift certificate. The final award of the afternoon, as described in Betty’s report, was the presentation to Steve and Patty Husko, Mr. & Ms. Grand Prix, of the prestigious Sandra Madden Award for Exceptional Performance. They each received an elegant trophy and a $50 gift certificate.